By Alan C. Legasto, M.D. and Stephen Waite, M.D. A 51-year-old man presented to the emergency department with cough and fever. Medical history and review of systems were remarkable for a smoking history of half pack/day, alcohol and heroin abuse (he quit 5 years prior to presentation), as well as hepatic cirrhosis. Physical examination was remarkable for poor dentition. 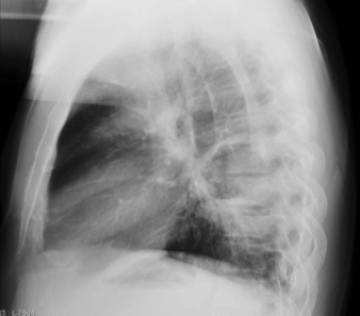 The patient was referred for chest radiographs to evaluate for pneumonia, followed by chest computed tomography (CT) (Figure 1). 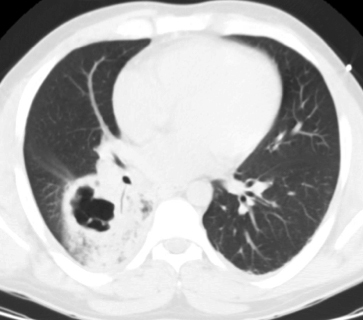 In adults, cavitary lesions of the lungs result from acquired processes causing central necrosis of the pulmonary parenchyma. Etiologies include a variety of infectious and malignant pathologies, with infection being more common. Although the imaging features of a lung abscess with cavitation may be identical to those seen in other infectious and neoplastic conditions,1 for example, certain patterns may suggest the underlying etiology. Knowledge of these findings and patterns is essential when confronted with a cavitary lesion on imaging. Infection by mycobacterial and fungal organisms can manifest as cavitary pneumonia. Reactivation tuberculosis (TB) cavitates much more frequently than primary TB, unless it is of the primary progressive type. 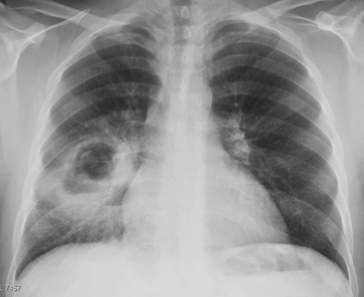 Coccidioidomycosis (particularly the persistent primary variant) and Aspergillosis (particularly angioinvasive) are fungi that frequently cavitate in the lungs.4 While the imaging features of mycobacterial and fungal infection can be indistinguishable from pyogenic lung abscesses, patients with upper lobe involvement of a cavitary pneumonia should be ruled out for TB, as that is the common site of reactivation TB. Primary squamous cell carcinoma of the lung accounts for approximately one-third of lung carcinomas but is the most common primary lung tumor to undergo necrosis and cavitation.2 It is frequently central in its lung location, presenting with an endobronchial component, which is a useful discriminator when present. Cavitary lung metastases are uncommon with the majority related to squamous cell neoplasms, particularly a head and neck primary.2 Primary squamous cell cancer of the lung can be indistinguishable from lung abscesses on imaging, especially in the absence of a visible endobronchial component. The multiplicity and random distribution of metastatic squamous cell cancer to the lungs is helpful in distinguishing it from a lung abscess. If enlarged mediastinal lymph nodes are also present, histologic sampling of the lymph nodes may be more advantageous for diagnostic and staging purposes than sampling of a large necrotic lung mass. Septic emboli commonly occur in patients with infectious endocarditis, infected central catheters, or intravenous drug abusers. They usually manifest as multiple peripheral pulmonary nodules with a lower lobe distribution. The presence of feeding vessels leading into the nodules is a helpful sign to suggest the diagnosis. Cavitation often occurs within a week of nodule development.2 Often, the nodules will have different stages of necrosis and cavitation. Staphylococcus aureus is the most common cultured organism.2 The multiplicity, peripheral distribution, and feeding vessels of septic emboli help to distinguish it from other diagnostic considerations. Radiologic patterns of cavitary pulmonary lesions in adults result from a variety of etiologies, typically infectious or neoplastic. Although each entity has unique features that may aid in establishing a diagnosis, significant overlap of imaging findings frequently confounds decision making. Approaching each case based on the clinical context improves the specificity of image interpretation. Often, however, follow-up imaging or biopsy may be required to establish the correct diagnosis. Taira N, Kawabata T, Gabe A, et al. Lung cancer mimicking lung abscess formation on CT images. Am J Case Rep 2014;15:243-245. Webb RW, Higgins CB. Thoracic Imaging: Pulmonary and Cardiovascular Radiology. 2nd ed. Philadelphia, PA: Lippincott Williams and Wilkins; 2010. Prather AD, Smith TR, Poletto DM, et al. Aspiration-related lung diseases. J Thorac Imaging 2014;29:304-309. doi: 10.1097/RTI.0000000000000092. Jude CM, Nayak NB, Patel MK, et al. Pulmonary coccidioidomycosis: pictorial review of chest radiographic and CT findings. Radiographics 2014;34:912-925. 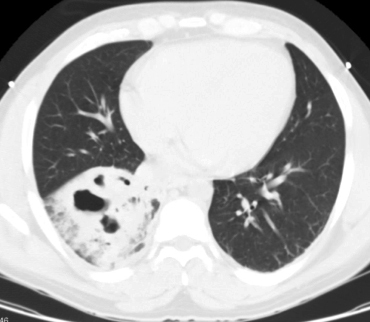 Legasto AC, Waite S . Cavitary Lung Mass. J Am Osteopath Coll Radiol. 2015;4(4):23-24. Alan C. Legasto, M.D. and Stephen Waite, M.D. Dr. Legasto is with the Department of Radiology, Weill Cornell Medical Center, New York, NY and Dr. Waite is with the Department of Radiology, SUNY Downstate Medical Center, New York, NY.